Review by AllTheBestFights.com: 2016-12-10, pretty boring fight between Ismael Londt and Jamal Ben Saddik: it gets two stars. The former SuperKombat Hw champion Ismael Londt entered this fight with a professional record of 41-7-1 (18 knockouts) and he is ranked as the No.3 heavyweight in the world. He lost to Badr Hari last year (=Hari vs Londt) but then he has won three bouts in 2016 winning the Glory Hw contender tournament against Jahfarr Wilnis (=Londt vs Wilnis) and beating Hesdy Gerges in his last one (=Londt vs Gerges 2). His opponent, Jamal Ben Saddik, has a kickboxing record of 29-6-0 (24 knockouts) and he entered as the No.10 in the same weight class. He also lost once in 2015, against Brian Douwes, but he came back to win in 2016 with Andre Schmeling and Gordon Haupt. Londt vs Saddik is on the undercard of Rico Verhoeven vs Badr Hari – Glory 36 Collision. Watch the video and rate this fight! Review by AllTheBestFights.com: 2016-06-25, pretty good fight between Ismael Londt and Hesdy Gerges: it gets three stars. The former SuperKombat Hw champion Ismael Londt entered this fight with a pro kickboxing record of 40-7-1 (18 knockouts) and he is ranked as the No.3 heavyweight in the world. He lost to Badr Hari in 2015 (=Hari vs Londt) but he came back to win in 2016 defeating Anderson ‘Braddock’ Silva (=Silva vs Londt) and Jahfarr Wilnis (=Londt vs Wilnis). His opponent, Hesdy Gerges, has a record of 49-15-1 (23 knockouts) and he entered as the No.7 in the same weight class. He also suffered one defeat in 2015, against Jahfarr Wilnis, but he has beat Grégory Tony in 2016. In their first fight Londt defeated Gerges by tko (March 15, 2013 Londt vs Gerges I); this second bout is on the undercard of Robin van Roosmalen vs Sitthichai Sitsongpeenong 2 – Glory 31. Watch the video and rate this fight! Review by AllTheBestFights.com: 2016-04-16, close and tough fight between Ismael Londt and Jahfarr Wilnis: it gets three stars. The former SuperKombat Hw champion Ismael Londt, has a record of 37-6-1 (18 knockouts) while his opponent, Jahfarr Wilnis entered this fight with a kickboxing record of 29-6-1 (8 knockouts) and he is ranked as the No.3 heavyweight in the world. 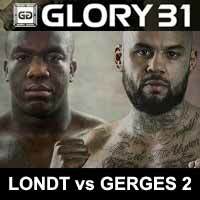 Londt vs Wilnis is the final of the Glory heavyweight contender tournament, in the semifinal Londt defeated Anderson ‘Braddock’ Silva (=Silva vs Londt) while Wilnis beat Kirill Kornilov (=Wilnis vs Kornilov); undercard of Nieky Holzken vs Yoann Kongolo – Glory 29. Watch the video and rate this fight! Review: 2013-08-08, not very technical fight but with some good and tough exchanges: Ismael Londt vs Benjamin Adegbuyi gets three stars. Ismael Londt ranked as the No.11 heavyweight in the world, entered the fight with a record of 34-5-1 while Benjamin Adegbuyi had a record of 16-2-1. Londt vs Adegbuyi is the main event of “SLAMM!! Soema na Basi IV”. Watch the video! Review: 2013-03-15, nice and tough fight with one knockdown: Mirko Filipovic vs Ismael Londt gets three stars. Mirko “Cro Cop” Filipovic entered the fight with a record of 21-7-0 while Ismael Londt ranked as the No.13 heavyweight in the world, entered the fight with a record of 34-4-1. Mirko Filipovic vs Londt is the final of “K-1 World Grand Prix 2012 Final”. Watch the video! Review: 2013-03-15, good second round between Ismael Londt and Dzevad Poturak but it is not enough to get three stars. Ismael Londt (33-4-1) entered as the No.13 heavyweight in the world while Dzevad Poturak (49-21-1) entered as the No.4. Londt had to face Badr Hari in the semifinal but the Moroccan has broken his foot during the quarterfinal, so he was replaced by Poturak who won the reserve fight against Sergei Lascenko; Londt vs Poturak is the semifinal of “K-1 World Grand Prix 2012 Final”. Watch the video! Review: 2013-03-15, tough fight and good finish: Ismael Londt vs Hesdy Gerges gets three stars. Ismael Londt (32-4-1) entered as the No.13 heavyweight in the world while Hesdy Gerges (41-11-1) entered as the No.10. Londt vs Gerges is the quarterfinal of “K-1 World Grand Prix 2012 Final”. Watch the video! Review: 2012-12-22, the second fight between Ismael Londt and Pavel Zhuravlev was not particularly good: two stars. Ismael Londt (32-3-1) entered as the No.13 heavyweight in the world while Pavel Zhuravlev (41-7-1) entered as the No.7. In their first fight Londt defeated Zhuravlev by split decision (November 19, 2011); this second fight is the final of the SuperKombat WGP 2012 heavwyeight tournament. Watch the video!